با وجود رسانه‌های اجتماعی مجازی چون تلگرام پدیده شایعه رواج بسیاری پیدا کرده است. از طرفی دیگر وقتــی مخاطــب از اطلاع‌رسانی شبکه‌های رسمی، مانند تلویزیون قانع نشود و حس کنــد در جریان کل پدیده یا رخداد قرار نگرفته اســت، ضمن کم شــدن اعتماد به جریان اطلاع‌رســانی رســمی، ســعی در کسب اطــلاع از طــرق دیگر مانند پیام رسان‌های موبایلی می‌کند. به مرور زمان و در نتیجه منطقی این اتفاق، اخبار منتشــر شــده در پیام رسان‌های موبایلی کــه همواره ممکن است آمیخته با شایعات باشد به‌عنوان منبع مورد مراجعه مخاطبان قرار می‌گیرد. در این پژوهش با هدف بررسی میزان باورپذیری پدیده «شایعه» در پیام رسان‌های موبایلی بین مردم شهرستان اهواز با تأکید بر نقش «رسانۀ ملی» به انجام رسیده است. روش پژوهش، پیمایشی و ابزار اندازه‌گیری، مصاحبه و پرسشنامه است. جامعه آماری کلیه افراد 15 تا 60 سال ساکن شهر اهواز هستند که بر اساس آمارنامه کلان‌شهر اهواز در سال 1390، 728955 نفر بوده‌اند. روش نمونه‌گیری خوشه‌ای چند مرحله‌ای است. نتایج نشان داد 8/48 درصد پاسخ افراد اعتماد خود را به مطالب ارائه شده از رسانه ملی را زیاد و خیلی زیاد دانسته و 2/51 درصد افراد اعتماد زیادی به مطالب ارائه شده از رسانه ملی ندارند. همچنین 62 درصد افراد اظهار داشته‌اند که در صورت مواجهه با اخبار متناقض رسانه ملی را جهت آگاهی از اخبار واقعی انتخاب می‌کنند. همچنین در حدود 80 درصد افراد رسانه ملی را قابل اطمینان‌تر از پیام رسان‌های موبایلی می‌دانند. Rumors are unofficial and invalid statements that create in several steps within communication systems, since information transmitted from a person to another, so there is huge chance for mutilate information. (Gloria 2015). Today rumors in social messengers, for example Telegram, are very rampant and on the other side, Telegram users and people believed this rumors easily and even retransmit that rumors. One of the main reasons that users interests in diffusing rumors on social messengers is that they are not adhere to Gothenburg - Written communication principles and so they go from first Oral communication to second one. On the other side when audience does not convinced by official media (like national TV) and feels the event whole or partly doesn’t expose to him (by TV policy officers or reporter). So they lose trust in official news agencies and therefore try to get information from other ways like social messengers, resulting that audiences use news and rumors (planned or unplanned) that diffuse in social messengers as a source of information. In this thesis researcher wants to investigate if national (government or state) media inform audiences truly, can we still observe rumor transmission and retransmission on society? How much of the national media is effective in the growth of this phenomenon? In fact researcher wants to investigate the Relation between Trust to the National Media and the Reliable Predictability of the Rumors that spread in Telegram (social messenger) in Ahvaz (city). آل‌پورت، گردن و لئو پستمن (1374). روان‌شناسی شایعه، تهران: مرکز تحقیقات و مطالعات و سنجش برنامه‌ای صدا و سیمای جمهوری اسلامی ایران. بدیعی، نعیم و هوشنگ عباس‌زاده (1374). «بررسی میزان اعتماد دانشجویان به رسانه‌های خبری». فصلنامه علوم اجتماعی، دانشکده ارتباطات علامه طباطبائی،‌ شماره 7 و 8: 216-179. دادگران، سیدمحمد (1384). مبانی ارتباط جمعی، تهران: نشر مروارید و فیروزه. قاسمی، طهمورث (1383). «سواد رسانه‌ای؛ رویکردی جدید به نظارت»، فصلنامه رسانه، شماره 4: 106-85. مکارم، حمید (1378). «شایعه‌سازی و راه‌های مقابله با آن»، فصلنامه مکتب اسلام، شماره 3: 70-65 . Bevan, S. and Krewel, M.(2015)» Responsive elections: The effect of‌public‌opinion‌on political campaigns«. Electoral Studies.‌Vo l40, Pages 548-555. Buckner, H. Taylor. (1965) »A theory or rumor transmission«. The public opinion quarterly. Vol. 29, no. 1. Christofides, E., A. Muise, and S. Desmarais. (2009). »Information Disclosure and Control on Facebook: Are they Two Sides of the Same Coin or Two Different Processes«. CyberPsychology & Behavior. 12(3): 341-345. Gloria, Y. Tian, Hsin-I Chou. And Xiangkang Yin. 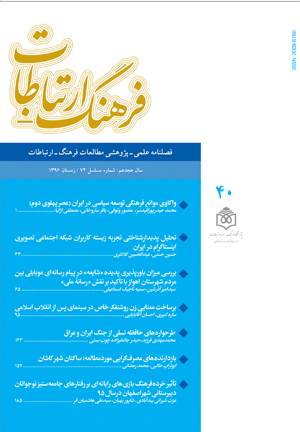 (2015).»Takeover‌rumors: Returns and pricing of‌rumored‌targets« International Review of Financial Analysis,‌Vol 41,‌Pages 13-27. Hunter, Eileen. (2012)»Class List [not equal to] Friend List«. Educational Horizons. Vol 90, No 2, p21-22. Kim, k., Min Bae, Y. and Kim, N. 2015. Online news diffusion dynamics and‌public‌opinion‌formation:A case study of the controversy over judges’ personal‌opinionexpression on SNS in Korea. The Social Science Journal,‌Vol 52. Matsumoto, T. and Laver, M. (2015).» Public‌opinion‌feedback between elections, and stability of single-party majority governments«. Electoral Studies,‌Vol 40, Pages 308-314. Moy, Paticia. (2000) »Media Effects on Political and Social Trust«. Journalism and Mass Communication Quartely. Vol 77, Issue 4, P: 744-770. Noon, Mike, Delbridge, Rick (1993) »News from behind my hand: gossip in organizations« Organization Studies 14/1,. Uslaner, Eric. M. (1998). »Social capital, television and the mean world: trust optimism and civic participation«. Political psychology, vol 19, no 3. Waddington, K. and Fletcher, C. (2005) »Gossip and emotion in nursing and health-care organizations«. Journal of Health Organization and Management, vol 19, no 4-5. Moreno, Y. Nekovee, M., Bianconi, G. and Marsili, M.(2007)»Theory of‌rumour‌spreading in complex social networks«.Physica A:Statistical Mechanics and its Applications,‌Volume 374, Issue 1,‌Pages 457-470. Mutz, D.C.(1998). Impersonal Influence: How Perceptions of Mass Collectives Affect Political Attitudes. Cambridge, MA: Cambridge University Press.